Oventrop offers BIM product data of valves and controls for TGA (technical equipment of a building) planning. The data serves to support the planning of heating and cooling systems in the BIM process. With the “BIM product data” Oventrop offers an extended service portfolio to their professional partners. 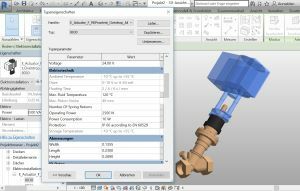 The data is available for many Oventrop products in Revit and VDI3805 format. These are, amongst others, products of the categories “thermostatic valves,” “actuators”, “double regulating and commissioning valves”, “flow regulators” and “collectors”. The “BIM product data” not only includes CAD data but also technical product data required during the BIM planning process. The combination of CAD data and technical data allows for a simple integration of the Oventrop product data into the planning software “Revit” for example. The data is available on the Oventrop homepage under www.oventrop.com and on the platforms www.vdi3805-portal.de or www.mepcontent.eu. The company Oventrop is one of the leading European manufacturers of valves, controls and systems for the Building Services Industry. The company is an expert partner to the stockists, consultants, contractors and industry. Oventrop offers its partners a long term beneficial relationship.